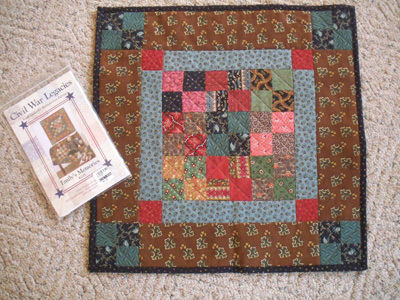 I was cleaning my sewing room and came across a flimsy….I had always intended to hand quilt it. But…after having the flimsy quilt top sitting there for over five years, I have decided…. “It ain’t never gonna be hand quilted by me!” So here it is. Machine quilted…. and FINISHED! (don’t you think finished can be one of the most wonderful words in the English language?) The pattern is Emily’s Memories, by Carol Hopkins Designs. It’s just a small quilt measuring 18″ x 18″. That’s why I thought it would be a good first project to hand quilt. I am not sure where this little guy is going. It might look great hanging outside….but wait. I didn’t put a sleeve for hanging on the back of it! Well I take that back. It might not be finished….looks like I’ll be adding a sleeeve.